As any homeowner knows, issues arise that need to be taken care of. This is especially true with plumbing, because rarely do people think about it unless there is a problem. Like many things, out of sight means out of mind. That’s not necessarily bad, but when you suspect something isn’t right with the pipes in your house, it’s best to be proactive and call a plumber. Plumbers can do camera inspection to determine what may be going on with your plumbing system. Maybe you’re having a problem with low pressure or maybe your drains are draining very slowly – even after using over the counter products meant to unclog them. If there’s one thing that’s true about plumbing, it’s the sooner you take care of a problem the less expensive it will be. Although many ‘do it yourselfers’ like the challenge of fixing things themselves, this isn’t always a good idea with plumbing. Sure, you can go to any home improvement store and buy a camera inspection kit for a few hundred dollars, but it’s true that you get what you pay for, especially when it comes to these cameras. Many of the camera inspection equipment products you can buy are limited at best. They come with short cables and the quality of the picture is very low. If you can’t really see what you want, it doesn’t make sense to use a low quality camera or a cable that is limited in length. Another problem with these types of cameras is they don’t stay in one position while they snake through the pipes, so you can be looking inside the pipe from any direction without having a reference point. 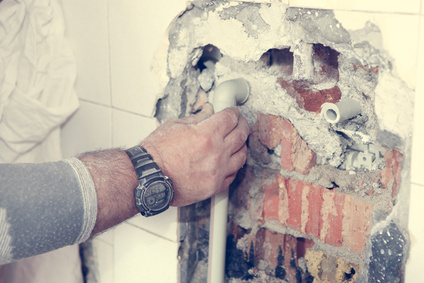 When you hire a professional plumber to perform camera inspection, you’re getting a trained professional who will come with state of the art equipment to really see what’s in your pipes. Whether you have a clog 10’ down or almost 300’ and near the city sewage lines, you’ll know exactly what the problem is. The camera on a professional plumber’s inspection equipment will not only extend much greater lengths, but it also maintains its positioning while traveling through the pipes, so the plumber will know exactly where a leak or break is, whether on top, bottom, or the side. This expert equipment also comes with a detection device so that when the camera stops at the problem, the detection device will alert the plumber of where it is above ground, enabling them to dig right where the problem is. Some homes in Melbourne, Florida have very old trees growing on the property and many times the roots will travel great distances to find water, eventually seeking it from a home’s pipes. This is easily visible from a professional camera and something no store bought one would be long enough to reach. So when you’re concerned with what’s really in your pipes, give a professional, licensed plumber a call and see what’s really lurking down there.